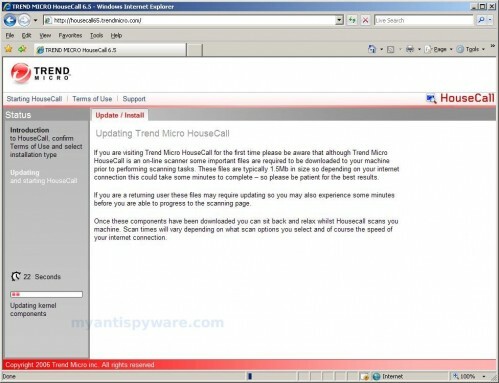 TrendMicro online virus scanner also known as Trend Micro HouseCall is a free web application for checking whether your computer has been infected and providing you with the option to automatically clean viruses, spyware, or other malware. Also HouseCall performs additional security checks to identify and fix vulnerabilities to prevent reinfection (only ActiveX version). 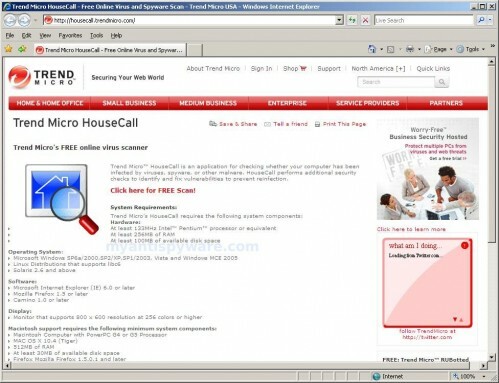 Click here for open TrendMicro Online Scanner site. Click on Click here for FREE scan, then click Get HouseCall Free Scan and you will see introduction screen as shown below. Read introduction information, then check the Yes, I accept Term of Use and click Launch HouseCall. 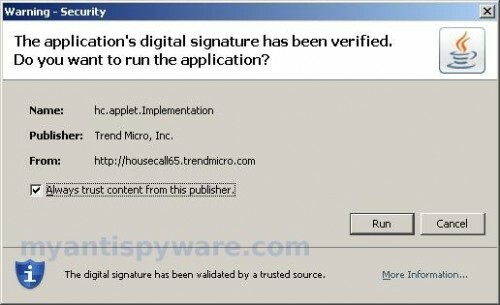 TrendMicro online virus scanner will perform a compatibility check on your computer. Once the compatibility check have finished, you will see a screen similar to the one below. 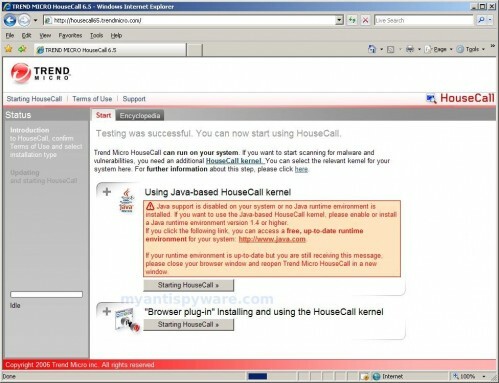 At the step you can select HouseCall kernel. Only using “Browser PlugIn” (ActiveX component) you can perform additional security checks to identify and fix vulnerabilities to prevent reinfection. Click Starting HouseCall >>. You may see a prompt similar to the one below. This is perfectly normal and safe and you can click on the Install or Run (Java HouseCall Kernel version) button to continue. TrendMicro virus scanner will now start downloading and updating HouseCall components as shown in the image below. When the scanner has finished downloading, you will see a screen as shown below. At the screen you can make a few changes. Select whats you want to check for viruses (complete computer or only a few folders). If you want access a more detailed selection of available operation modes, then click the Extended Select tab. Click Next, TrendMicro virus scanner will now start updating scan engine and virus, malware information as shown below. When TrendMicro Online Scanner has finished updating, it will start scanning your computer for known infections. This procedure can take some time, so please be patient. Once TrendMicro Virus Scanner has finished scanning, you will see a screen similar to the one below. Now you can delete all detected infections or select an individual action for each detected infection, then click Clean Now button. Hi, I hope you can guide me. Desktop is freezing up after short time. I can hear something starting up [hum]. My start button and ribbon are being covered up. Tried F8 trick, without success. Have been hitting ctrl alt del to get off. Used Trend,PCillin; spybot; AVG and TPM but all say no virus. Freezing up problem. Almost brand new laptop. 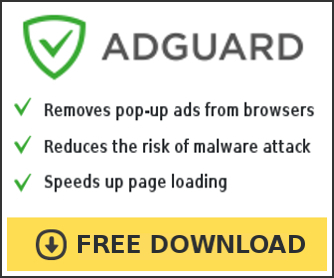 I notice problems arising when I go into mail.secure-aus.com to access my private emails. I have been unable to send out emails longer than a few lines. Freezing again. If you can help I would love you for ever. Make a new topic at our Spyware removal forum. I will check your PC.